Eye health requires a correct function of the tear duct. Our body produces tears constantly to protect the eye’s surface, which are drained through the tear duct. 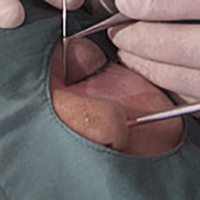 When it is blocked because of an injury, a tumor or because the drainage channel has not been fully developed, visual complications and infections such as conjunctivitis may appear. Multidiode™ OFT and Multidiode™ OFT 4G lasers are the most innovative and effective technology for dacryocystorhinostomy. 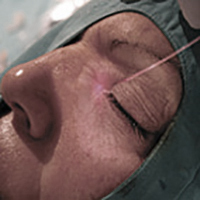 This delicate minimally invasive procedure patented by INTERmedic manages to restore the normal function of the tear duct without altering the natural anatomy of the eye. Multidiode™ OFT and Multidiode™ OFT 4G laser treatment is performed with local anesthesia and consists of introducing a very thin flexible fibre through a rigid endoscope into the tear duct. The laser energy is applied, without the complications associated with external surgery. The process is fast, safe, and very accurate, since the fiber includes a transilluminator to ensure a perfect external visual control of the operation process. Multidiode™ OFT and Multidiode™ OFT 4G are high-power semiconductor lasers, specially designed by INTERmedic for minimally invasive lacrimal surgery. It is the first laser in the world with CE and FDA certificate for this specifical clinical application. The 980nm wavelength of Multidiode™ OFT and Multidiode™ OFT 4G lasers is well absorbed by haemoglobin and water, the competent chromophores in lacrimal surgery. This helps laser energy to perfectly penetrate into the tissue, an essential factor to ensure good results in dacryocistorrynosthomy. The platform also has an excellent cutting and coagulation power, when working in Surgical mode.